The Ultra Complete Package from Wilson really does live up to its name, Wilson is and have been one of the main Golf Club manufacturers for a while now. They seem to have mastered the ability to create amazing Clubs at an equally amazing price. Every Club in the set is really good and would look at home in any golf enthusiasts collection! If you’re not on a massive budget but still want to be guaranteed quality and want a set that will last you many years then you may want to give the Wilson Ultra a second look. Driver- This Graphite driver will completely change the way you play. Because it is made of Graphite instead of the usual Steel this driver is much lighter than some of the other options on the market. If you’re new to Golf this could be a massive benefit. Fairway Woods- The Fairway Woods have also been constructed using Graphite; this is again great for the user as they can get a faster swing, therefore a better hit. Although many experienced Golfers prefer to play with a Steel club if you’re new to Golf then you may find your arms aching when you get home if you’ve been playing with a Steel Club all day. There are 3 Kinds of woods in this set which should be more than enough. They all have a natural incline which gives them improved accuracy. Irons- Just like most collections of this size you get irons from the 5-iron all the way to the PW. It may seem as if you are missing out on a couple, but these will be made up for with the addition of a few Hybrid Clubs. Hybrids- Hybrid Clubs are pretty much a mix between Woods and Irons. The great thing about Hybrids is how much money they save you. Without them, you would have to buy a full set of both Irons and Woods. That would pretty much do the same job as these Clubs will when you’re out on the course. You will get 4 Hybrids in this collection which should be more than enough for you to get those effective shots from anywhere whether it be near the green or in a longer grassier area. Putters- This set comes with one of the best putters for beginners and you should have no issue in improving your accuracy and skill level every shot with this club. As it has a Heel Toe Weighted Alignment it helps to give better control and accuracy overall. 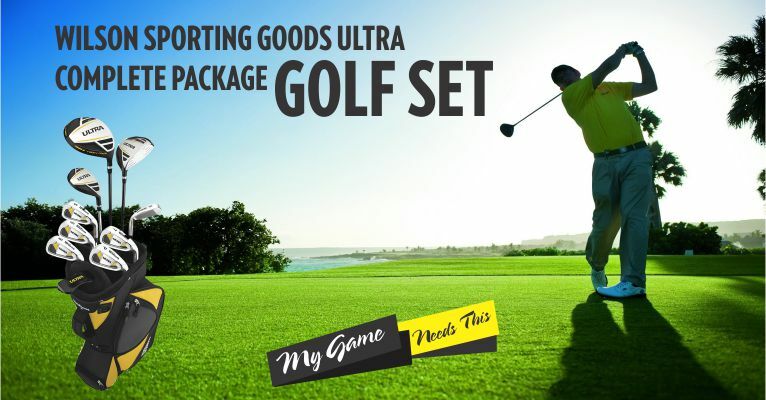 The set is fairly priced, meaning that it is the right golf club set for beginners who will receive a lot of value for their money. It also means that they don’t have to spend a small fortune to get started in golf. It comes with covers which will go over 3 of the bigger clubs. The bag has a lot of storage space which will help when it comes to carrying around other golf related items. The bag is included with the set, so no need to worry about buying an extra bag. Hybrid irons are included within this set, which will eliminate the need to buy any long irons. Great grips, meaning that you will feel comfortable using these clubs straight away. Provide the means to produce a great swing, due to the balance and lightweight nature of the clubs. The bag only comes in a yellow color, which if you are not happy with this, you cannot select any other color option. Only comes with 3 covers for the bigger clubs, meaning all the other club heads may become damaged easily. No sand wedge is provided within this set, which will mean that you will need to go out and purchase one. The clubs may be of a high quality, but they are only ideal for a beginner as a pro would require something more tailored to their playing style. The driver’s head needs to be improved as it comes loose when used only have a short time, so it will need to be replaced regularly. When it comes to shopping for the best golf set, it is important that you do your research. Not only will you find out more information about the club set you are looking to purchase, but you may find out more information about the game also. If you want to play it safe then it is always a good idea to purchase a golf set from one of the leading brands such as Wilson. With this being an extremely affordable set, it is ideal for both beginners and those who are a little more experienced in the game. There are a few things wrong with this set, mainly being the poor quality of the driver’s head and the lack of covers provided for the club heads.